This terminology of military spokespeople applies of course not only to the present Gaza “conflict,” but almost universally to others from the U.S. war in Afghanistan to the closing days of the war in Sri Lanka. It has become especially applicable these days to U.S. drone warfare, from Afghanistan and Pakistan to Yemen, where it is self-verified by simply defining all male victims as presumed “militant combatants,” whether they were planting IEDs or digging a hole to plant their crops. Let’s translate: “Palestinians will be allowed to just barely eat, sleep and breathe if they surrender their right to resist and accept whatever political crumbs the United States and Israel decide to offer years, or decades, from now.” Israel gets guaranteed “security” while its victims receive some “improved conditions.” After twenty years of a “peace process” that produces no peace while Israeli settlements gobble up the West Bank and strangle Palestinian East Jerusalem, it’s all too clear what that means. 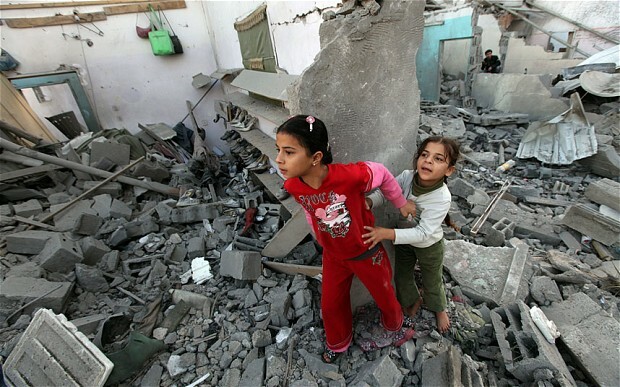 There is a problem: Despite the horrific suffering in Gaza, whole families wiped out in their homes, schools and media centers and the soccer stadium bombed to rubble, the cynical and vicious operation by the Israeli regime was fundamentally as futile as the previous ones. In the short run it has practically ensured Netanyahu’s reelection in Israel’s January elections, but in the new Middle East political configuration it will not end the ability of Hamas to govern Gaza and engage in resistance. The fact that Palestinian resistance is meaningless in conventional military terms is beside the point. The disruption and trauma it’s caused in the lives of the Israeli population — miniscule as that is in comparison with the human carnage in Gaza, as well as the misery in the Occupied Palestinian Territories as a whole — is politically intolerable. The Netanyahu government is forced to promise that it will “eliminate the menace from Hamas rockets once and for all,” a promise that it cannot keep and that its U.S. enablers cannot deliver. Hillary Clinton put enormous pressure on the government of Egypt to force Hamas to stand down — using its longstanding ties with the Egyptian military and the implied threat to cut off U.S. aid — but today’s Egypt led by the Muslim Brotherhood is not yesterday’s compliant Mubarak regime. The Egyptian regime today is far from being “anti-imperialist” or socially progressive, and wracked with internal conflict, but it is forced to respond to the sentiments of its population in a way that the former one never was. For that matter, the Hamas strategy cannot liberate Gaza, let alone free Palestine, but it does express the reality that Palestine cannot and will not simply give up. The United States and Israel are caught in a trap of their own making. It appears that the Obama administration last summer extracted a promise from Netanyahu to back off from attacking Iran without U.S. permission — especially in advance of the U.S. election — in exchange for giving Israel blanket permission to run amok in the Occupied Palestinian Territories. As tensions along the Israel-Gaza grew, the Israeli government found itself confronting a very serious threat — the threat of a genuine, permanent truce. In fact, the leader of the Hamas military wing, Ahmed Jabari, had prepared the organization’s negotiating position, which was known to the Israeli leadership. That is why he was murdered by an Israeli air strike while driving in the center of Gaza City. It is a very old pattern going back to the 1982, 1973 and even 1967 wars: Arab initiatives for peace are always the greatest “danger” to the Zionist reliance on permanent war and threats of war. Prior to the cease-fire announcement, the Israeli army had massed for a land invasion of Gaza, but the international political costs to Israel and the United States of a massacre on that scale would be enormous — while at the same time, the economic costs to Israel of a longterm mobilization of reserves also mounted. The Obama administration surely wanted to avoid the nightmare of a ground invasion of Gaza, but is unwilling or unable to put pressure on the Israeli government for a genuine peace agreement, fearing a Congressional backlash at a time when it’s desperate to come to a budget deal. After the cease-fire, Israel continues its practice of shooting at civilians “too close” to the Gaza border, with fatal results. Nonetheless, Hamas emerges from this latest carnage with enhanced political authority, including the credibility to negotiate — if the Israeli regime is interested in serious negotiation. As things now stand, the deal that is emerging is going to be what was on the table before the assassination of Ahmed Jabari, before the bombing, the deaths of 40 children and wounding of hundreds more, and the other mass destruction — all of it unnecessary, useless and criminal. It’s important to demand the lifting of the Israeli-U.S.-Egyptian siege of Gaza, and a cutoff of all U.S. aid to Israel. But while emergency demonstrations are important, they won’t change the causes of this massacre, which lie in the expulsion of the Palestinian people and the denial of their basic rights. Given the complete moral and political collapse of the Obama administration (and Europe) in the face of Israel’s criminality, it is overwhelmingly important for the international Boycott, Divestment and Sanctions (BDS) movement to step up its grassroots activism. Global outrage in support of the rights of the Palestinian people is the best tool at hand for ending the most recent massacre and much bigger ones looming ahead.